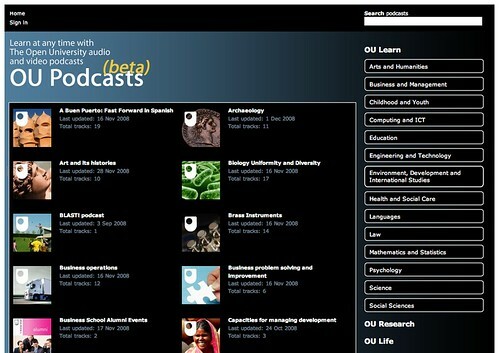 Another day, another OU web play… Realising that the OU on iTunesU presence has its downside (specifically – having to use iTunes), you can now get hold of OU “enhanced podcasts” from the OU Podcasts (beta) site. The architecture of the site borrows heavily from the OU Youtube presence, offering Learn, Research and Life options (even if they aren’t populated yet). The pages for actual “programme” elements contains an embedded (though not shareable or embeddable?) player, along with subscription feeds for the topic area the “programme” is assigned to. The programme page has a rather redundant “Permalink for this page” (err – it’s in the browser address bar? ), and there doesn’t appear to be a link to the actual audio file, which might be useful going forward, but there is a range of topic/channel podcast subscription feeds. 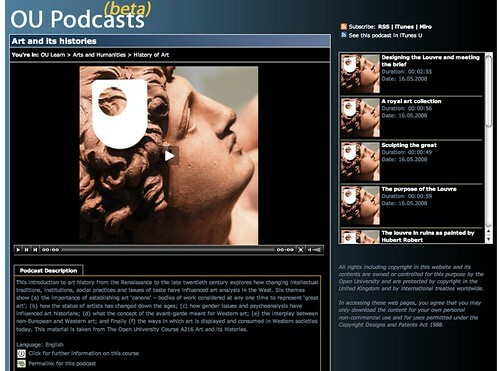 The URL design looks neat enough, too, taking the form: http://podcast.open.ac.uk/oulearn/arts-and-humanities/history-of-art/ (that is, http://podcast.open.ac.uk/oulearn/TOPIC/PROGRAMME/). So while it doesn’t look like there is much benefit to logging in at the moment, it seems as though there is a possibility that the site will be offering hosting for individually produced podcasts (using Amazon S3, I believe…) in the near future? I’m not sure where individually produced podcasts would live on the podcasts site, though? In the appropriate topic area? PS a couple more minor quibbles, just because…;-) The favicon is a KMI favicon. This doesn’t really fit, IMHO. The release of the Podcasts site has not been reflected (yet) with a mention on the /use site, which looks increasingly “stale” (there’s no mention of Platform there, either…). Although there doesn’t appear to be an opportunity for Faculties or Departments to have a presence, as such, on the site (unless they provide content for topic areas? 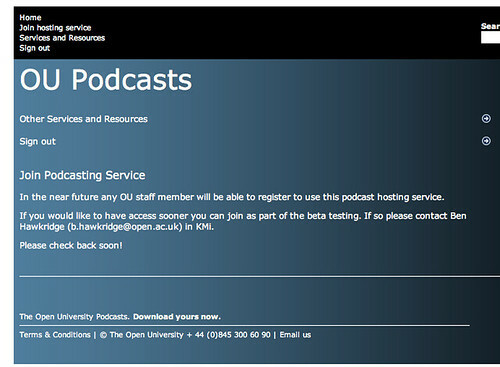 ), I wonder whether the podcast site back end could actually be used as a content delivery service for Departmental content (e..g. the content on the Department of Communication and Systems website). I think I can answer some of your comments. Yes, there is some duplication. This system manages the metadata, creates the XML files, and looks after the media (which is uploaded to Amazon’s S3 service once the podcast and/or tracks are complete and approved). The management of both the iTunes U and YouTube websites is done via their own systems. Whislt the is an API for the former, we haven’t looked at it yet. If you browse around, you’ll notice that there are some podcasts that are in more than one node of the subject tree – the permalink provides a more direct link to the podcast, regardless of which nodes its in. Not automatically, no, but some content that’s currently on open2 may well migrate to the new site. > So while it doesn’t look like there is much benefit to logging in at the moment, it seems as though there is a possibility that the site will be offering hosting for individually produced podcasts (using Amazon S3, I believe…) in the near future? Yes. Podcasts can also be limited to SAMS login-only access. Incidentally, all the media is hosted on Amazon S3 – the OU doesn’t have anywhere near enough bandwidth to support this venture. @hockeyshooter great work! What about the KMi favicon though? Huh? Tony.. /use/ will no doubt be updated by comrade Brown at somepoint. Is it stale cos it’s out of date or stale looking?